This post describes how Stunnel can help making GetKafka and Kafka 0.8.x connection secure. Stunnel is a proxy that can make insecure network transmission secure by wrapping it with SSL. This article contains example and illustrations describing how it works and how to configure it. Most part of it is derived from this informative Git comment I wouldn't be able to set it up without this comment. Thank you for sharing such detailed example. Kafka Broker joins the Kafka cluster and declares its address as 127.0.0.1:9092. 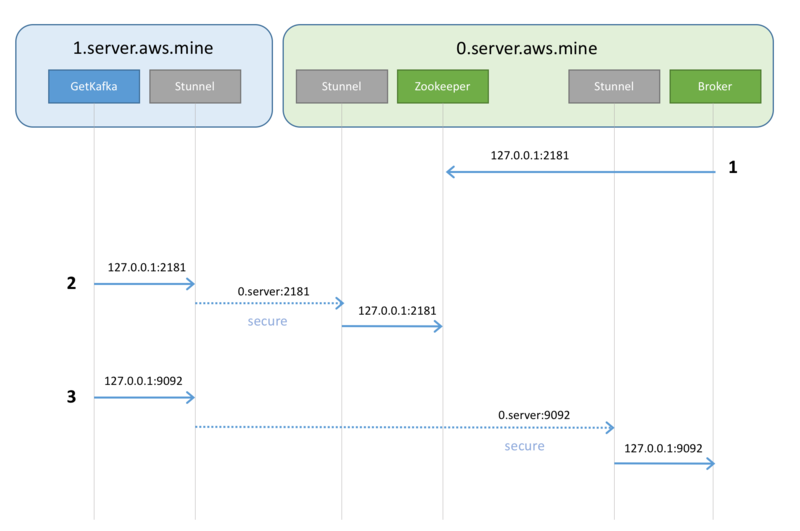 If Zookeeper is in different server (recommended) and you need to secure this connection via Stunnel as well, then you need to apply the same method as the one used between GetKafka and Zookeeper. GetKafka's Zookeeper Connection String is set to 127.0.0.1:2181 which is local Stunnel is listening to. Then the local Stunnel on 1.server proxies the request to 0.server:2181 over SSL. At 0.server, the request is proxied again by the Stunnel running on 0.server, then finally arrives at Zookeeper. Since the Kafka Broker running on 0.server declares its address as 127.0.0.1:9092, GetKafka (Kafka client) sends request to 127.0.0.1:9092, and the request eventually transferred to the Broker through Stunnel pair. How to authorize client access? Each Stunnel server has to have its own pem file containing a private key and a certificate. Also, a CA certificate file (or directory) is also needed to authorize client access. # It's not important which server to run the toolkit on. # Password for keystore.jks can be found in generated nifi.properties 'nifi.security.keystorePasswd'. I used cert.pem as the CAFile for Stunnel on 0.server. Refer Stunnel manual for further description on these configurations. 2017-03-09 06:50:48,690 WARN [Timer-Driven Process Thread-5] o.apache.nifi.processors.kafka.GetKafka GetKafka[id=b0a21b5d-015a-1000-fbba-2648095ae625] Executor did not stop in 30 sec. Terminated. 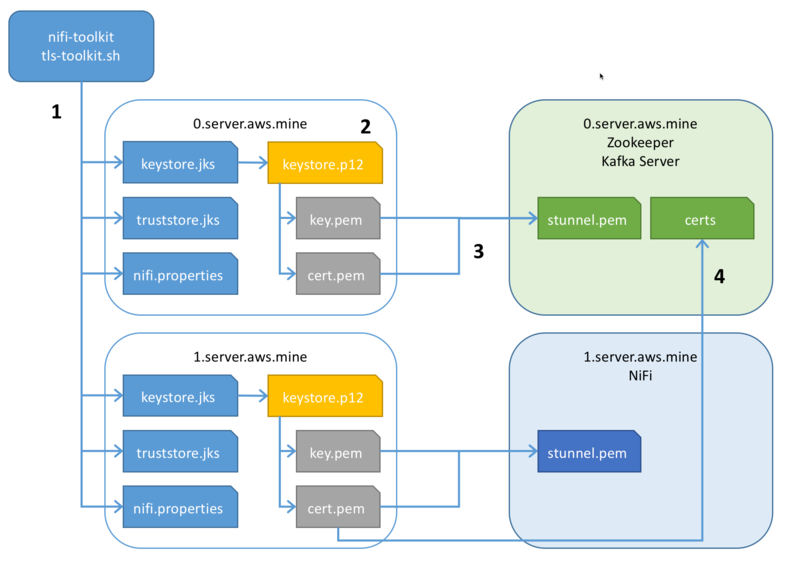 Although Stunnel works with GetKafka and Kafka 0.8.x, I recommend to use newer version of Kafka and ConsumeKafka NiFi processor with SSL if possible. 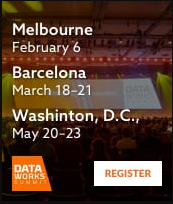 As it's written in the Git comment, this workaround is not scalable (in terms of required administration tasks) and complicated.